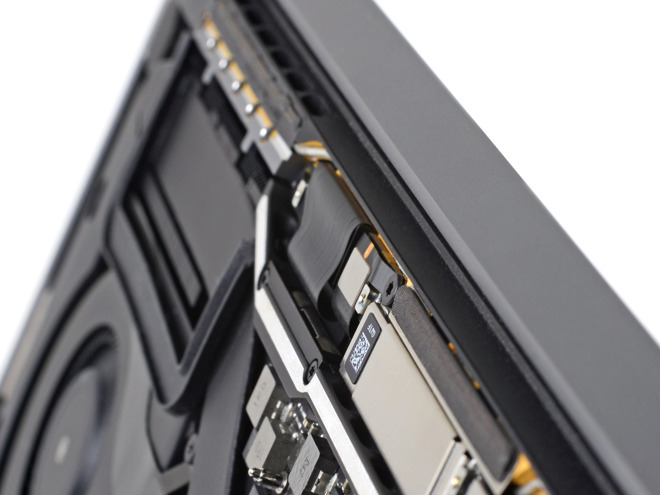 Repair advocate iFixit suggests that all of Apple's Touch Bar-equipped MacBook Pros may be vulnerable to fatigue failure of a thin flex-cable connecting the motherboard to the display. The cables wrap over the controller board, and though they're secured by spring-loaded covers they're subject to stress every time a Pro is opened or closed, according to iFixit. This is reportedly causing tears, most often hitting the backlight cable first and creating a "stage light" effect. The backlight may eventually start going out completely when opening a Pro's lid past 40 degrees. The culprit is said to be Apple's use of fragile flex cables instead of the wire cables used in earlier MacBook models. Though the current cables are thinner, wire cables can be routed through a hinge instead of around it, reducing wear. The blog post suggests that the primary issue is Apple's choice to build cables into the display rather than as a discrete and easily replaceable cable. With the present design, if one breaks the whole panel has to be replaced, which can cost several hundred dollars out of warranty. Though some people have been able to convince Apple to pay for replacements, others are being rejected or having to shell out. Several people have started threads on Apple's support site but had them deleted, iFixit said. One Mac owner has launched a petition calling on Apple to offer an extended warranty program. As of this writing, over 2,500 people have signed. The issue doesn't immediately appear to be affecting any other Macs. iFixit said it is concerned about the 2018 MacBook Air, which doesn't use an identical cable design but still wraps them over the controller board and merges them with the display. Service data collected over more than 25 Apple-authorized locations and Genius Bars by AppleInsider doesn't suggest that there is any increase in display-related failures in the 2015 MacBook Pro and earlier, versus the 2016 re-design and newer. However, a display cable rupture as postulated by iFixit in any model new or old isn't specifically identified in the data beyond a repair involving the display but not a de-lamination of the Retina Display coating. The service data doesn't prove that there isn't a problem, as the redesign in 2016 may have swapped one failure mode for another.